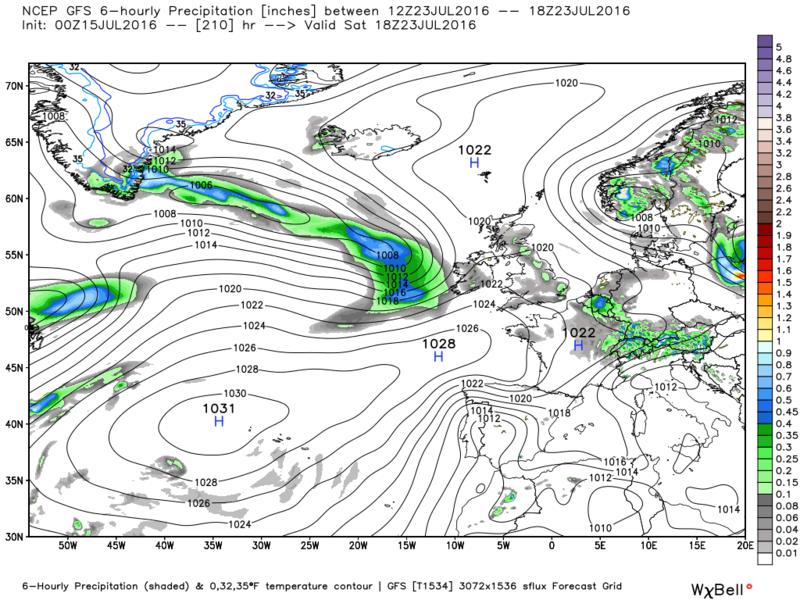 The GFS this morning. A front moving SE tomorrow portends a mainly cloudy day, clearing behind the front, Then a cell of HP travels east influencing England with frontal systems confined to Scotland and quite warm for a time. Overnight Tuesday and Wednesday a low moves north from Iberia bringing heavy showery conditions for a couple of days before moving away north east introducing a cooler airstream before the next Atlantic systems move in by the weekend. Massive swing in the right direction from the GFS. 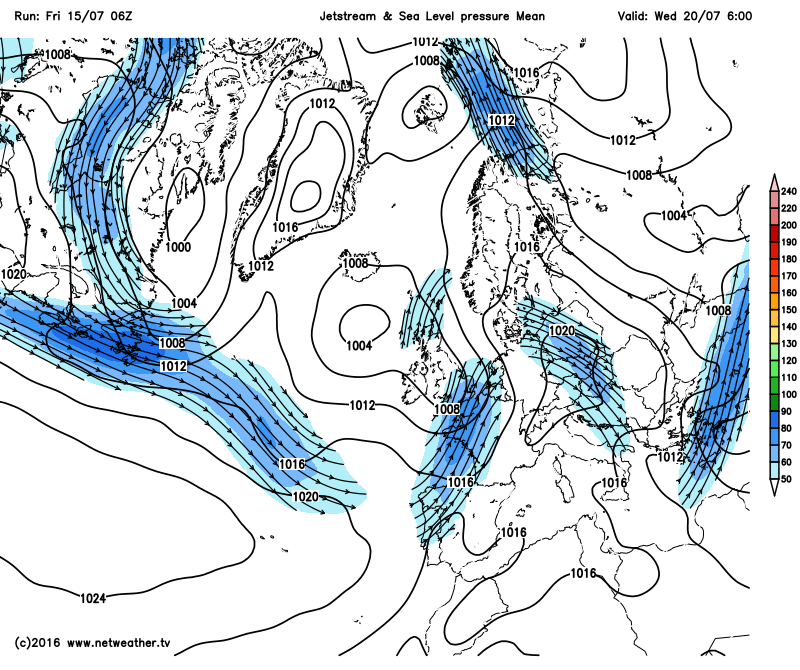 A stonker of a plume from Monday to late Wednesday! Main concern would be the nasty storms that would result. Substantial wind shear overlapping a very unstable environment. A close eye and bated breath will await each run from now on in! Next Tuesday/Wednesday temps could be touching 30c, With some big storms to boot for the South as shown by Net/WX-MR Model with some very high cape values..
Look like something out of the states with Cape and LI values that high! Seriously though, this could end up with some fairly big heat and some unbelievable storms by next Wednesday!! 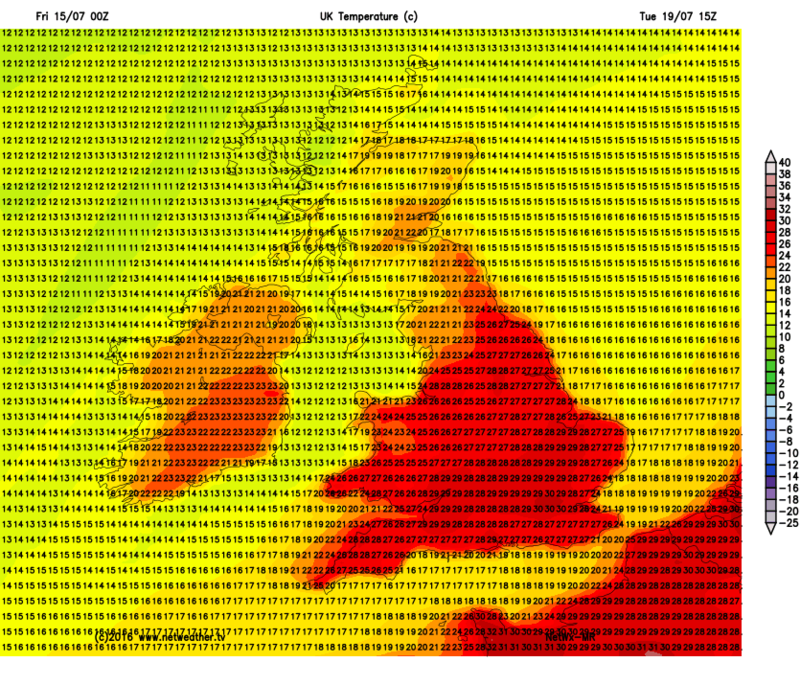 Thursday could be an absolute contrast with temps 10c lower in places! 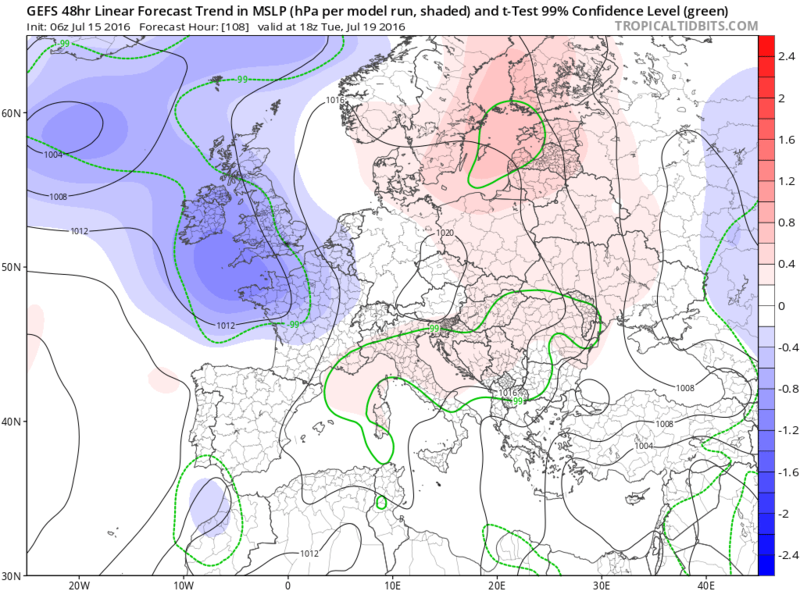 ECM has much less interaction from the low pressure during Wednesday daytime - though 850s are still above 15c in the south - looking like we might see the first30c of the year in a couple of places by Wednesday, before the heat is quickly washed away. 3 warm to hot days it is then! 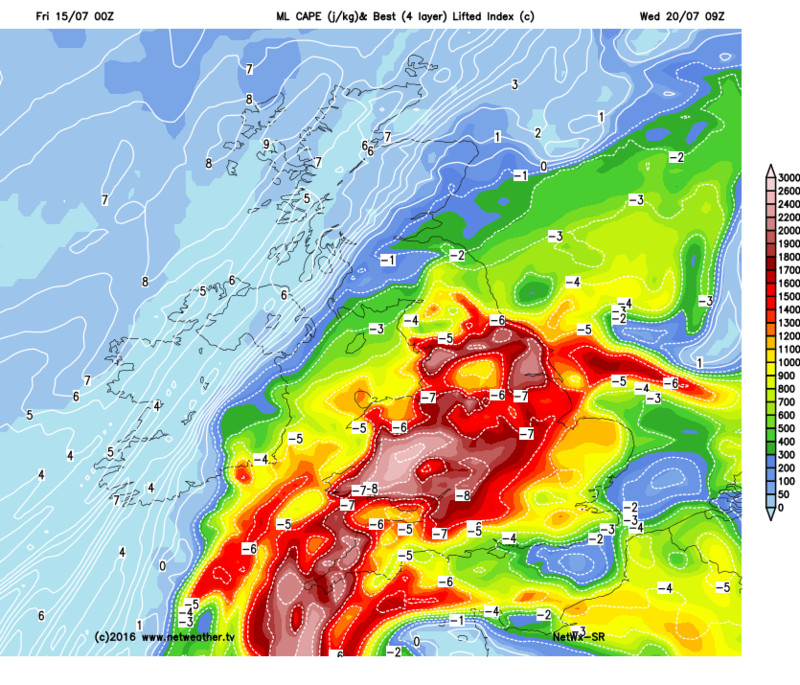 Could be quite wet Thursday as the low starts moving east. But of course this is a long way hence. I always find those charts slightly odd to process - we are trained from an early age to associate blue colours with coldness, and reds with heat.....on these it's in reverse! 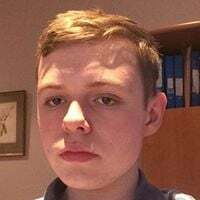 A bit off topic, but my 18th is on Wednesday, looks like there could be an MCS for my birthday, seems very likely now as shown by the ECM and UKMO models! I think for once, I hope there isn't one as I'm flying south from Bristol to Spain on Wednesday evening. Talk about bitter sweet! Without question the 00 runs now pretty much franks a very warm, even hot spell for most parts of the UK during the first half of the working week, but the breakdown already looks nailed on and given expected height rises to the N may well morph into another protracted cool, unsettled spell to close out the final 10 days of July. 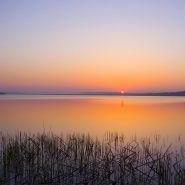 So at this stage we are looking at a 24-48hr event for most and perhaps a 72hr event for the few. Not saying I wouldn't take it at this stage in light of what summer has delivered so far, but from a purely personal perspective I'd have preferred to see much more muted temps coupled with the prospect of a pattern change, that might well have deliver some sort of balance for the 2nd half of so called summer. It looks like that after a blip at the end of the week a short period of drier and pleasant (not hot) weather may be in the pipe line to complete the ten day period with HP edging north to the west and the upper trough in decline. 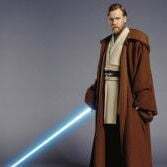 But this may well be short lived. 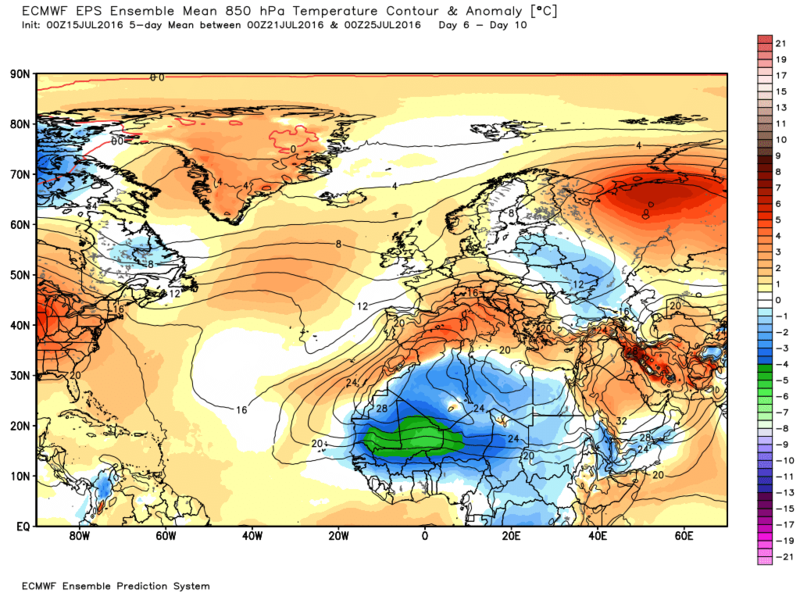 During the last days of July the EC32 amplifies the pattern with ridging into Greenland and a trough down over the UK. 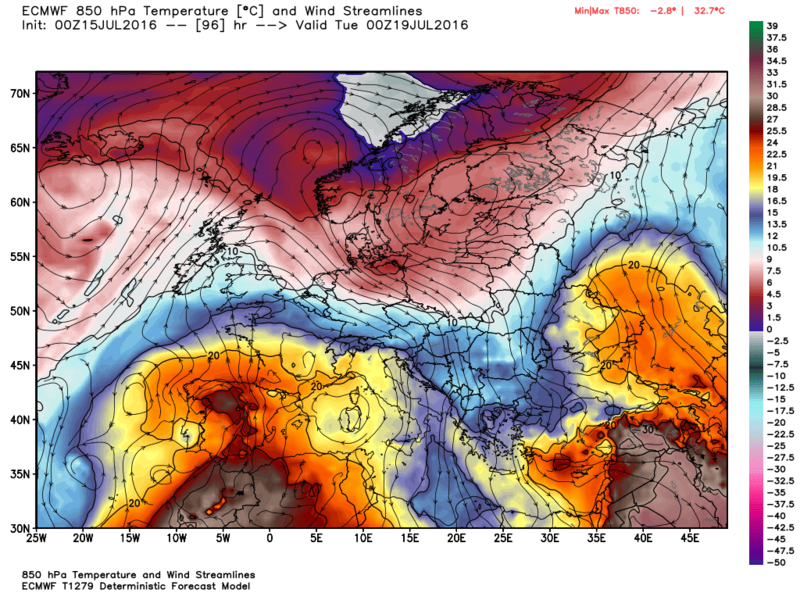 Ergo winds veering North westerly portending some unpleasant chilly weather for a few days. In fact although by this time the trough has moved east and the Azores HP becomes more influential the temps remain below average up to August 7th. Agreed looking at the bigger picture - on a slightly positive note, at least the 06 is less grim than the 00 was, tying in nicely with what you say regarding a brief spell of relatively pleasant weather to follow what might be a rather spectacular midweek breakdown for some. 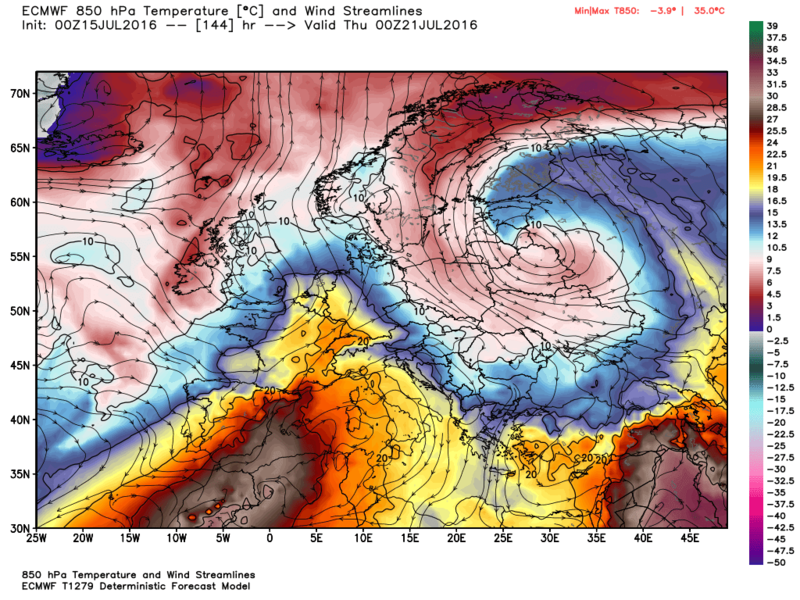 Not had much time to scrutinise the models this summer but they make for rather pleasing viewing today. 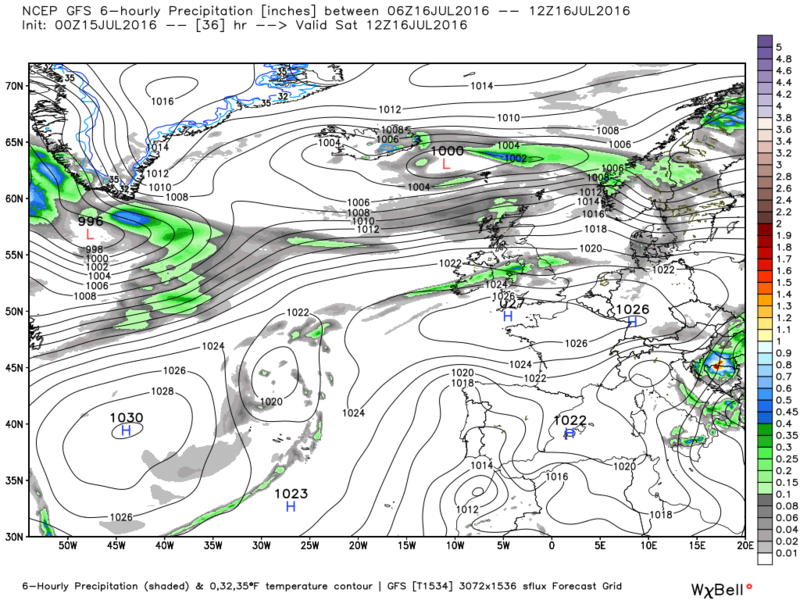 The fly in the ointment over the next few days looks to be weather fronts draped west to east over the UK but either side its looking drier and much warmer. 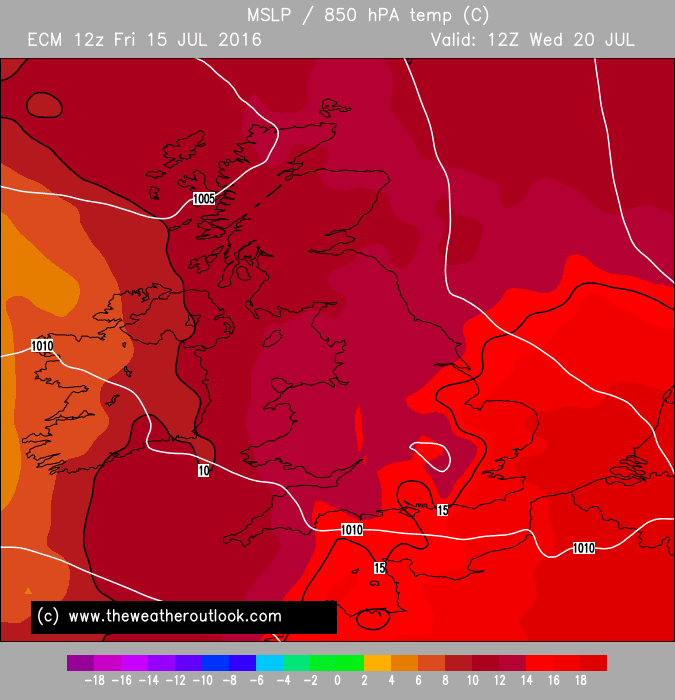 And a brief very warm/hot spell to look forward to midweek.  Edit: Original image overwritten by subsequent runs, so ignore. 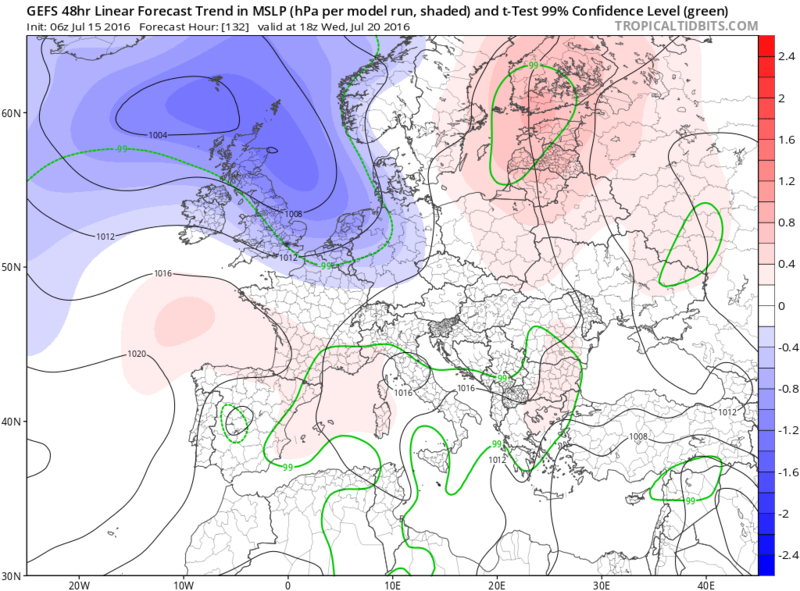 Having been away for a few days i have only been keeping tabs on the models via a phone but reading all the posts it seems although the general westerly pattern hasn't really changed we do look like getting some real heat at least for much of England and Wales early next week via an offshoot of the main Azores high cell. A look at the charts for T84hrs Monday shows the heat being transported north from the sub-tropics as that little high cell moves across the continent. 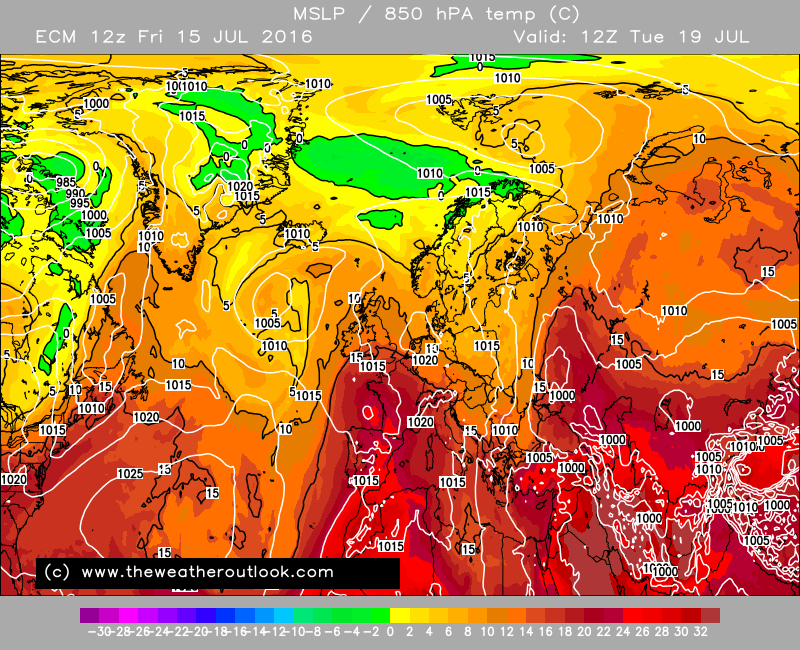 A real taste of high Summer for a short while before it breaks down later next week as inevitably the Atlantic jet returns along with more changeable and cooler weather. The general outlook from these just shows the mobility still present with occasional ridging from the AH and intermittent troughs moving across from the west. A case of enjoying any fine and warmer interludes while they last.As ever these will be more noticeable further south in this pattern. 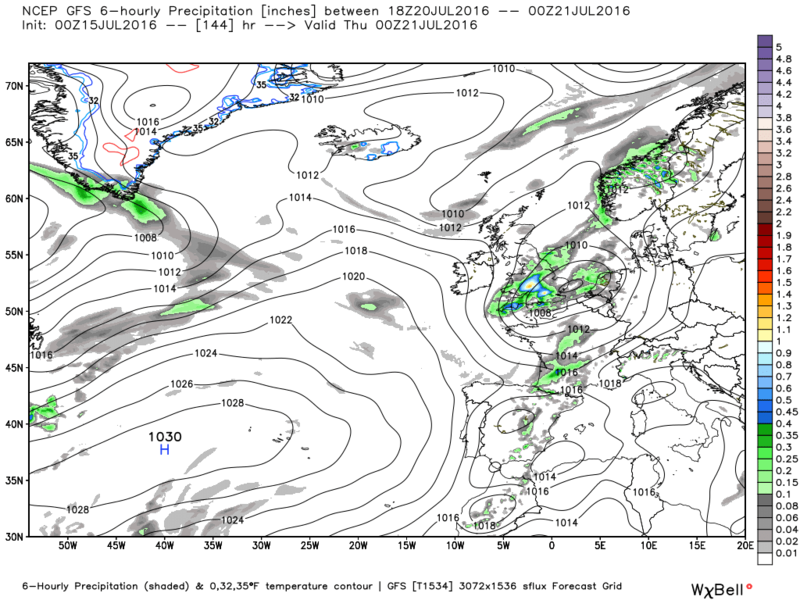 At the moment Tuesday still on course to be interesting before the next seven days return to westerly unsettled. Well a good chance that we will break our 30C duck for this summer on Tuesday. The GFS going for 27/28C widely across England and East Wales, given that the GFS can undercook max values, I suspect 30C could be reached in a few spots. 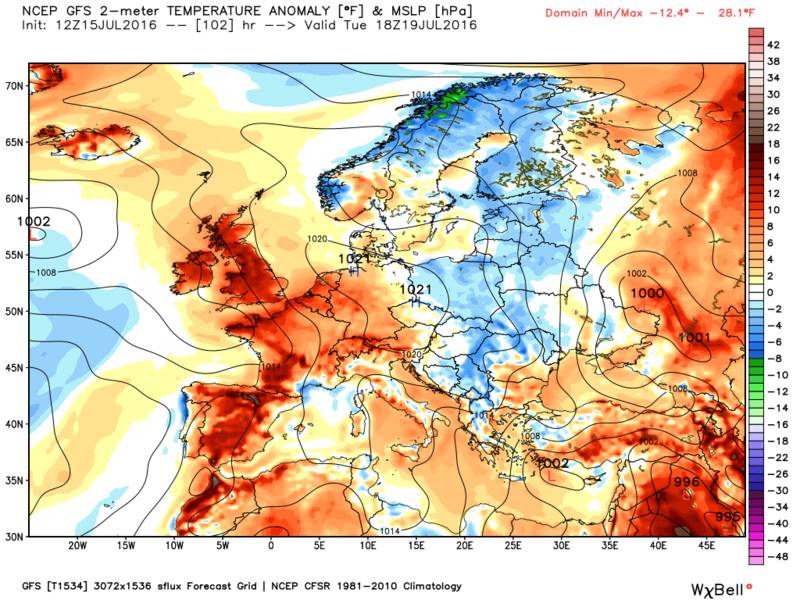 There will be uncertainty in how a developing heat low over southern France interacts with the incoming Atlantic trough and hence its track and timing, the models vary on this, we could scrape another very warm or hot day on Wednesday if the timing is slower like the ECM, or we could see us back in a more unsettled if still warm pattern by Wednesday. 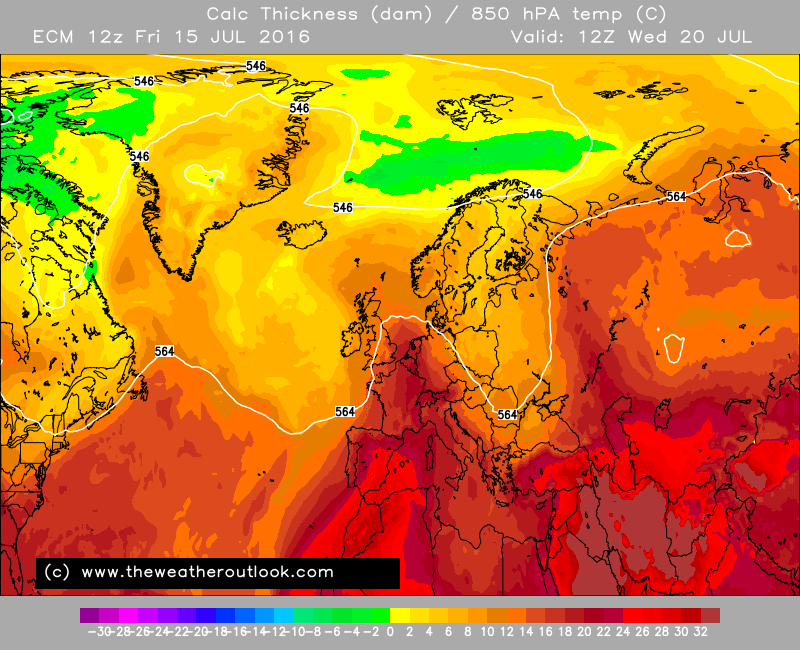 The GFS still puts parts of the south east in the very warm category for Wednesday. 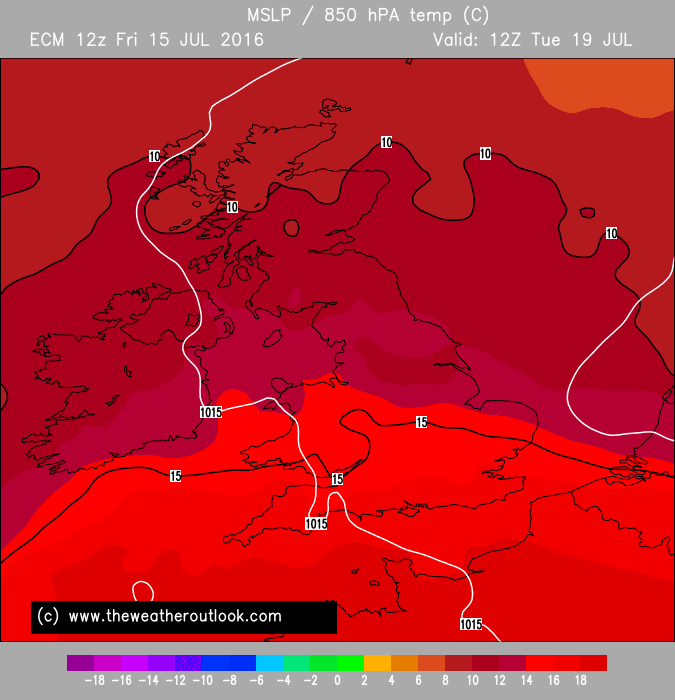 It is also worth baring in mind that the temperatures in the south at least will be in the very warm category from tomorrow onwards with mid twenties possible every day and warming up further on Monday. It does take a while for the warmth to push north of the Midlands though. Looks a bit meh after the heat tues with the jet heading back to its spiritual home, better make the most of tues imby .. These 'heat spikes' never last long with weak high pressure to the east and low pressure waiting out west and heat lows developing over the nearby continent. 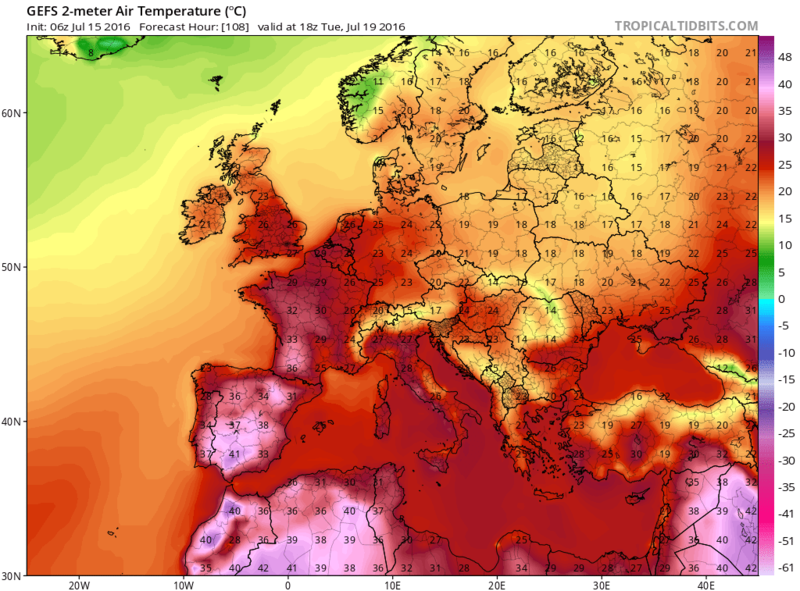 However Tuesday for France will bring some extreme heat with ~40c likely for some. If the ~20c 850hPa line can encroach a little further northwards and time itself well for Tuesday i cannot see why 32-34c cannot be ruled out. 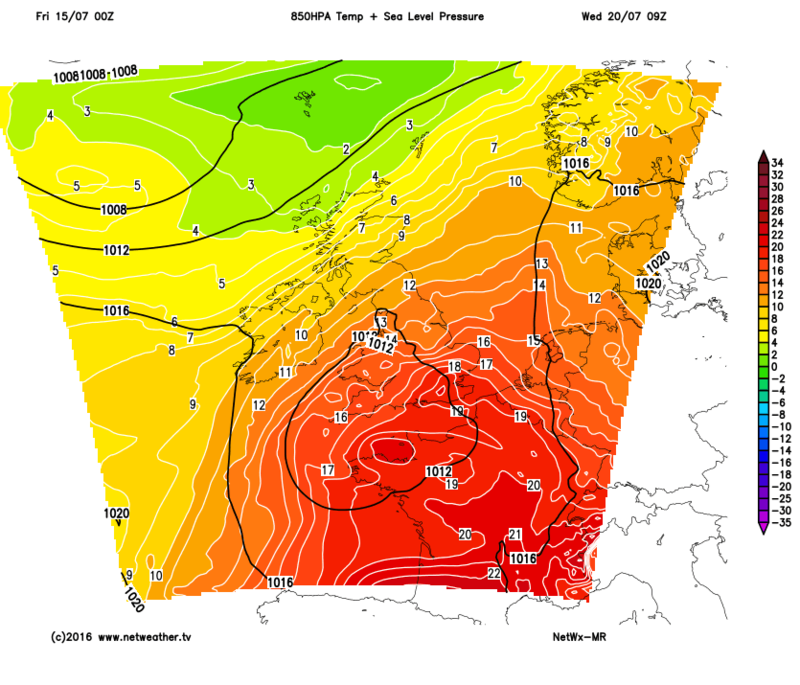 I would not expect it to be quite as extreme as 1st July 2015 but a similarish set up and what is of note is how large the plus 15c 850hPa body of heat will be to our south and penetrating northwards. If the incoming lows could slow down a little (yes a big ask for the UK lol), then in my opinion I see a possibility of a similar style day to last 1st July. In summary, delay the low just a bit and albeit brief, Tuesday has the potential to be a very hot day for central and southern (esp SE parts). Regardless, looks like a pretty hot one anyway! 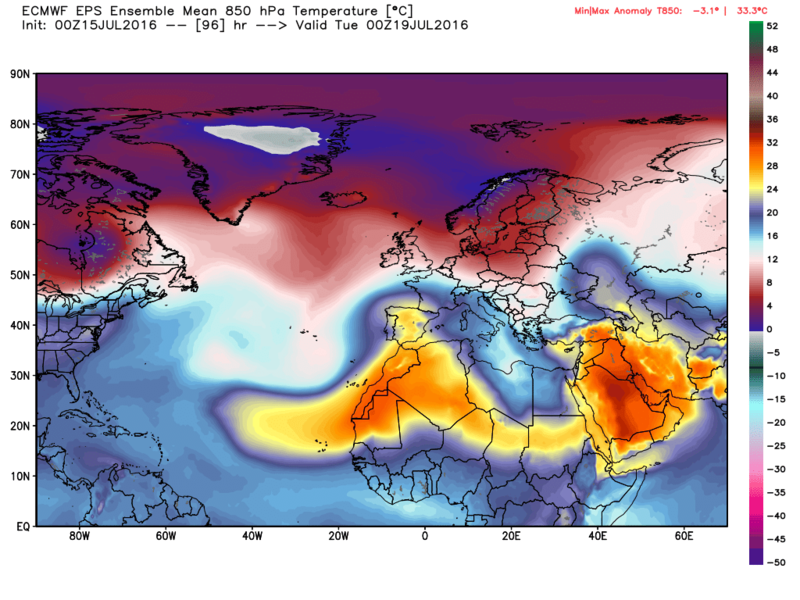 Anywhere within the 15c plus isotherm is likely to have a hot feeling day. The Ecm 12z shows Wednesday still looks very warm / hot and humid too in the s / e and thunderstorms look likely. 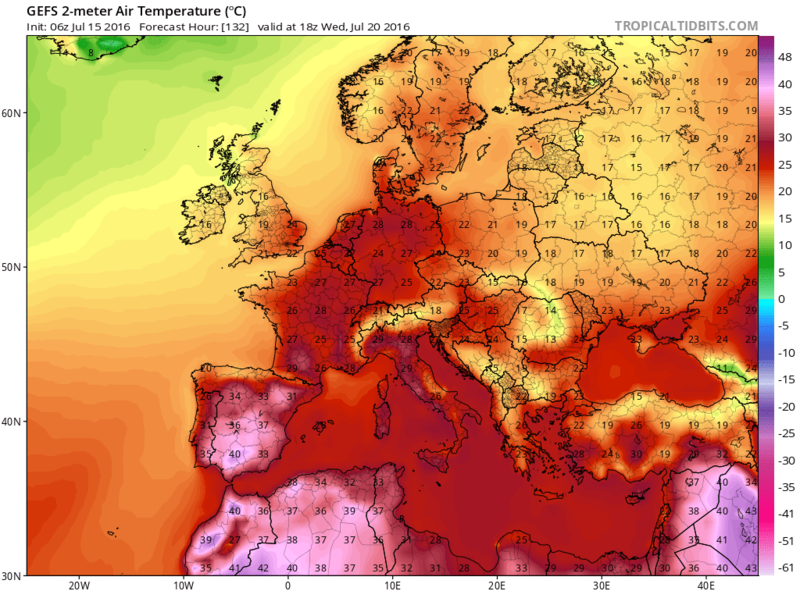 Nice to be talking about very warm and hot weather for the first time this summer as a realistic prospect. I'm pleased those hot perturbations I've been showing for days looks like being worth it! The ecm going for a hot day Tuesday26C -28C (England) 20C -24C (Scotland) in a light south easterly and running the low north on Wednesday and running it quite quickly NE into the north North Sea by 12z Thursday and temps back to normal. But all of this is subject to change in the next couple of days.